" You have no idea how popular the ZZZ songs are……… the children LOVE it from reception upwards. The littlies particularly enjoy spotting the weather words we have learnt and shout out when they recognise them, then of course they love to anticipate what the weather will be on the next day. The music itself is so catchy and tuneful, too. My only real issue is how to let them down gently in the lessons when we AREN'T going to put ZZZ on. I love the idea of being able to buy the CDs in bulk as the children love the songs so much, I'm sure they will be pleased to be able to buy it for themselves. I would never have imagined the enthusiasm that my children have for ZZZ! They absolutely love the songs and pick it up so quickly. They readily absorb the grammar points of gender agreement etc and sing like pros right from the start…..Many thanks for raising the enthusiasm in my classroom! They work like Trojans to get time at the end of each lesson to sing! " Double-sided Poster—Two in one ! For teaching and colourful display. 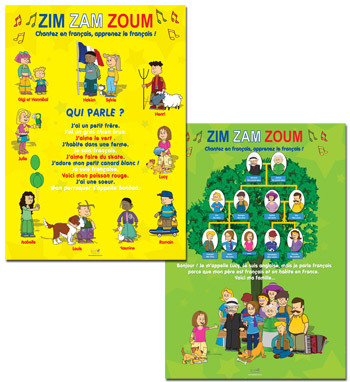 Featuring the charming ZIM ZAM ZOUM characters, this laminated poster complements the songs and is particularly appropriate for children learning colours, clothes, physical description, animals and family. Laminated and hard-wearing.